Come November, voters in New Mexico could elect the country's first Native American woman to Congress. 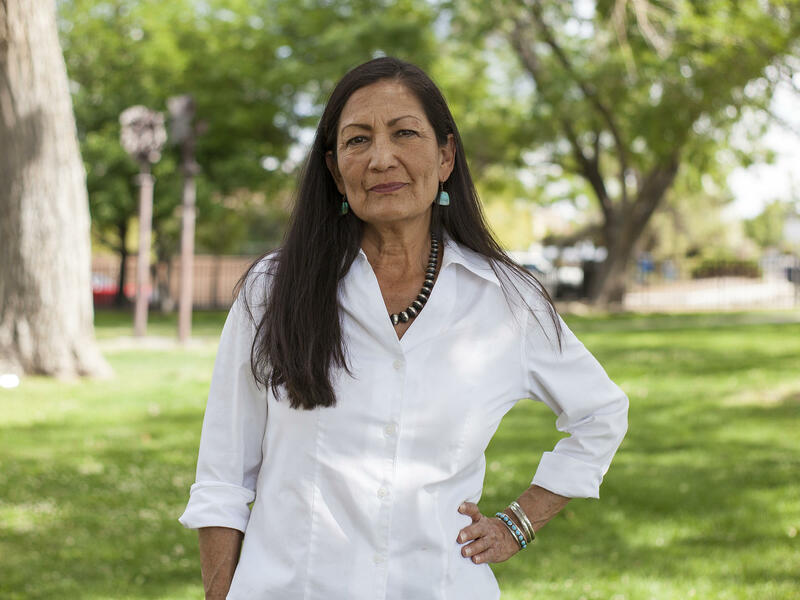 Deb Haaland is one of a record number of Native Americans running for statewide and federal office this year. NPR's Leila Fadel has the story. DEB HAALAND: I'm just reaching out to you today to let you know that we won our primary election. HAALAND: I identified with so much of what people go through in his district in and this state. Half of our population is Medicaid eligible. So a lot of single moms. So many people are paying off their student loans. FADEL: She's a single mom, went to public schools, lived on food stamps. And she's cast herself as a working-class candidate. HAALAND: I just feel like, I don't know, this is the year. A lot happened - right? - this year. Maybe we just all said separately, it's time for us to, you know, take the next step. FADEL: When she says all, she means the record number of Native American women running who could become firsts themselves. Not all of them will win this fall, but the sheer number matters, says Mark Trahant. He's the editor of the website Indian Country Today, and he's been counting Native American candidates for the last six years. MARK TRAHANT: There really is a record year this year. It's extraordinary. You see folks running for such a variety of offices. FADEL: There are two Native American men in Congress right now, both Republican. But the list of candidates this year has grown. Trahant expects as many as 10 Native Americans will be on the congressional ballot this fall, double the number in 2016. As for statewide offices, there are more Native Americans running for lieutenant governor alone - six candidates - than the number that ran for statewide offices across the country in 2016. Trahant says some of this is a reaction to the current political climate, but it's also the fruit of years of work by Native American organizers and politicians. And the candidates, he says, are dismantling stereotypes with campaigns that show the diversity of Indian country. There's Tatewin Means, who recently lost a primary for attorney general in South Dakota but had a groundbreaking political ad. FADEL: It was in Lakota, which Trahant says is the first time he's seen a political ad in a Native language. FADEL: There's also Sharice Davids, a lesbian ex-MMA fighter who is running for Congress in Kansas. SHARICE DAVIDS: It's 2018, and women, Native Americans, gay people, the unemployed and underemployed have to fight like hell just to survive. FADEL: She wears a T-shirt that reads strong, indigenous and resilient as she pounds a punching bag. Again, Trahant. TRAHANT: I think what's important about those ads is it will change people's perceptions about Native Americans in general, not just the political campaigns but how people perceive the Native community. FADEL: It's galvanizing Indigenous voters, who are often sidelined by voting laws and distrustful of a government that has taken so much from them. HAALAND: Oh, thank you so much. FADEL: That's clear when walking around with Deb Haaland in Albuquerque. All kinds of people walk up to congratulate her on her primary win, but it's different when the supporter is Indigenous. At a minor league baseball game, Robert Piper greets her. ROBERT PIPER: As a native Hawaiian, I'm very proud of you. I've been following your race. HAALAND: Oh, thank you so much. Thank you. FADEL: One of Haaland's interns gets emotional as she explains why she's working on the campaign. Dechellie Gray is Navajo. DECHELLIE GRAY: I see, like, my family in her family. And I think that's something that's really important that I've never seen before. So it's just, like, really emotional to me 'cause it means so much. FADEL: There's a lot of energy around this year's crop of candidates. But the question is, will that translate into more Native Americans showing up at the polls? Historically, Indigenous voters have had some of the lowest turnout rates of any group in the country. Leila Fadel, NPR News, Albuquerque.